I'm currently waiting for my girlfriend to come meet me at Seoul's Sinsa Station, so we can have dinner, so just thinking about food is a painful process right now. The blog is slowly starting to get more and more daily readers, so I hope you all enjoy the blog as much as I do writing it, and as always, if you have any comments or feedback, please leave me a comment below. This item was the last one I sampled on the Europe trip to Spain, Germany and Greece, I took with my mother back in January. Click the links to see the other reviews from this trip. I made a trip back to the same McDonald's branch in Madrid on our last day to give this Happy Meal a try. They had the standard Hamburger and Chicken Nugget Happy Meals available, but this pizza melt was new to me. I'm not sure if they offer it in other European countries, but I wouldn't be surprised if they did. Actually, I'm not a stranger to McDonald's Pizza, as my hometown Windsor, Ontario Canada was the launch market for McDonald's personal pizza back in the early 90's. It was eventually discontinued to the cost of the ovens and the time it took to make each pizza. This was back when Windsor McDonald's actually used to deliver! Even though the Pizza Melt was a kids meal, could easily eat it as a regular meal on a day that I'm not overly hungry (unlike tonight). 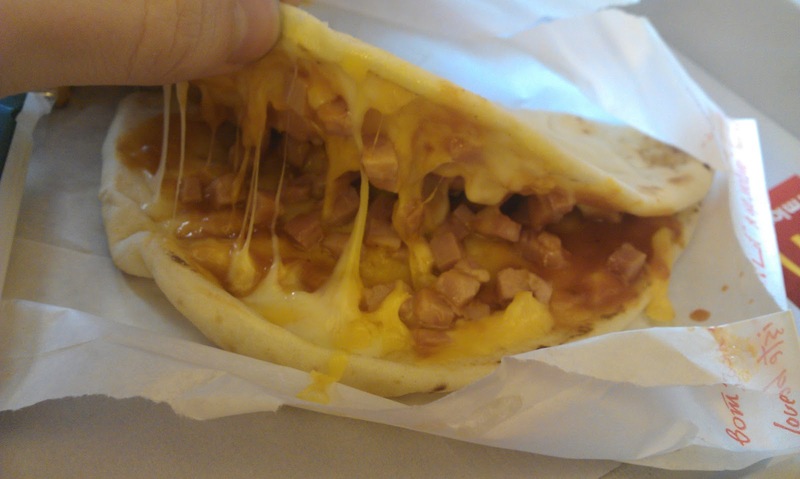 The melt itself had a decently thick pita/tortilla style wrap, it was much thicker than the snack wraps you can get in the Americas and Asia. Also, it had quite a bit of filling, the cheese was decent tasting and properly melted throughout (like all of the European McDonald's cheeses). As a side, you had the choice of regular fries or the jumbo 'papa frites' which I chose again, as I enjoyed them the first time. I think the amount of cheese and meat would be too much for a child, as I'm nearly 2m tall, and I thought it was pretty filling. 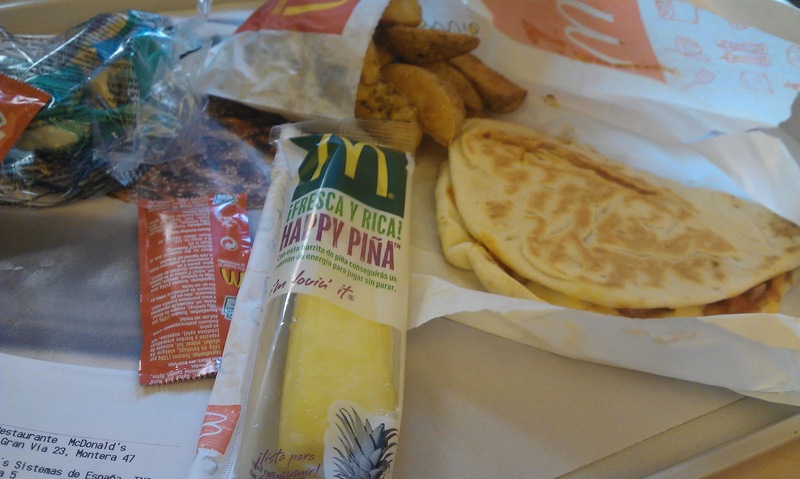 McDonald's started adding fruit to their Happy Meals as a part of their 'healthier' image throughout the world, and Spain offered the choice of cherry tomato's, pineapple or carrot sticks with cheese dipping sauce as an extra side. 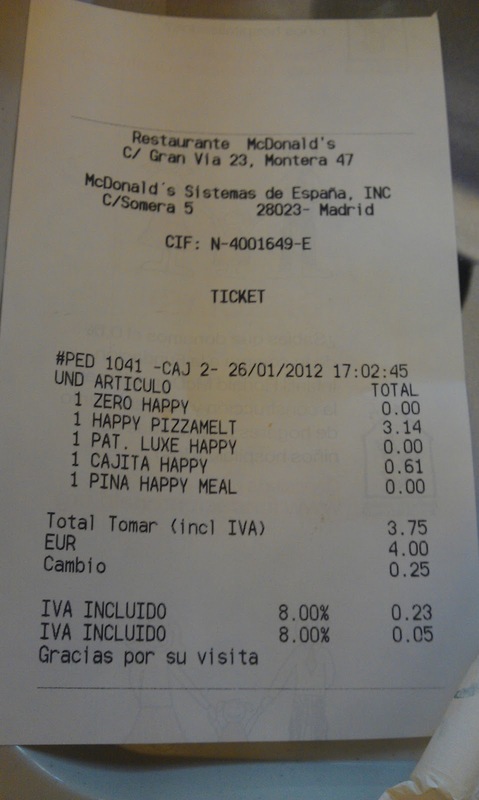 Together with a drink and the toy, it was quite a large meal for a kid, and a pretty great value at 3.75 Euro. Yum. It looks really yum. you are really super mcdonalds hunter. Yum yum yum yum.